After the announcement of the remaining matches, it will be decided after the talks with the organizers of the venues, the first match will be played on the home ground of Chennai Super Kings. In 2009, the whole IPL was held in South Africa, while in 2014, some matches of the IPL were canceled in UAE. This year, because of the World Cup on the ground in England, the IPL did not happen. The program has been modified. ICC Cricket Mahakumbh will be held from May 30 to July 14 in England. So far, the IPL matches started from the first week of April. 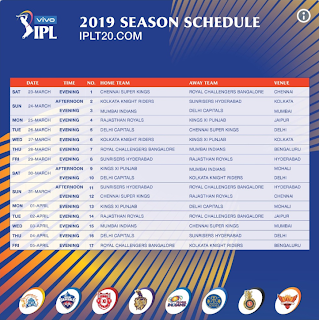 However, this time around, the World Cup has been taken into consideration and it has been decided to start the IPL season from 23rd March on Saturday.